Shoutout to Roy’s Bakery!! Breakfast pasties and an assortment of delicious muffins made for an easy and scrumptious Easter morning treat!! I highly recommend the breakfast pasties!! If you have never them you are missing out!! I had a small traditional pastie. Good portions, good price good food. Always a great time at Roy's! I don't think I've ever had anything I didn't like. One of my favorites is the chicken broccoli pasty! Don't forget the coffee and bakery. You have to try the strawberry-rhubarb bars!!! No trip to the Keweenaw is complete without pasties, and Roy's had awesome pasties! Roy's has a really nice selection of baked treats, they do sandwiches, and have really good coffee. I like eating in the upstairs loft, which has a wonderful view of the waterway and Hancock. My absolute favorite place to eat in town! Can't go wrong with Thanksgiving in a pasty! So many desserts to choose from. All delicious! I always leave satisfied. We love the chicken, broccoli, cheese pasties! Fantastic Owner and everything on the menu is delicious!! I can say a lot for Roy’s, from their coffee to their pasties. But today we stopped for one purpose and that was for their pazckis!! I’ve had them from other places but Roy’s pazckis are the best I have ever had in my life!! I just wish I didn’t have to wait a whole year to taste them again! Great pasties. Nothing more needs to be said. Also good baked goods and a nice location on the Portage. Atmosphere is lacking but the pasties are good. My favorite place for a pasty or donut to go. They also do great on custom birthday day cakes. Nice little sitting area as well. Great palace to stop and get some coffee before crossing the bridge! Wonderful coffee and sandwich shop----baked "treats" are superb! Lots of very good pasties on the menu, some original standards and some not so standard. The turkey, cranberry & stuffing pastie was really good. Thanksgiving dinner rolled into a pastie! They also have a lot of baked goods, bread, donuts & pastries. Great location right on the water with seating inside or out on the patio. Great traditional pasties and a variety or other wonderful baked items. Staff was friendly and helpful with answering questions. Go there!! The best bakery in town. I have yet to be disappointed! Good place. Been three times. Pasties are good. Pastries are better. Chilled drinks are a bit expensive. Delightful place. Busy. Great quick meal. 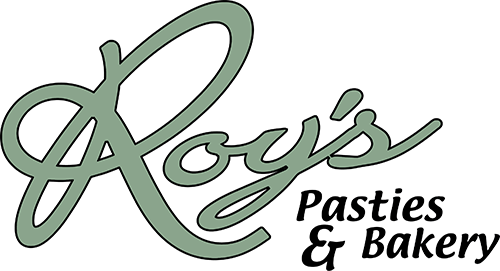 Some say Roy's has the best Pasties in the U. P. They may well be correct. Ordered a birthday cake for my son. It was excellent. They Fed My Nisu Craving! Great food, staff and view! Great view and outstanding pasties!!! My god the cinnamon rolls were to die for. Huge. One could be a meal. Would love to go back and glad I live in Arizona so I cant eat them Daily! Pasties were very good. My only compliant is that staff never knows their products. You have to ask multiple people what the flavors of donuts and pastries before someone knows. I go here every Saturday for a donut! Nice view of the Lake or river? Cranberry Turkey pasties are like Thanksgiving dinner. Totally delish! Got my pasty fix & wasn't disappointed! Very fresh, thin crust, flavorful filling. No need to engage in the ketchup vs. gravy debate. Also have fresh baked breads, cookies, etc. top it off with an amazing view of Portage Lake. I go to Roy's for the cronuts. They are wonderful, flaky, and the filling is fantastic - you can't get something like that anywhere else I've seen up in the Copper Country. They have a nice place indoors where you can sit and eat, too. Great pasties, chicken and broccoli is amazing! Had an excellent meal at a great price. Wait staff was great and recommended a fantastic beer. Doesn't look like much from outside but was well worth the stop. I had a meat pasties at Copper Harbor as part of a bike ride around the Keenenaw. Just possibly the finest meal I have ever had! I love eating here. They have amazing food they make themselves. They have gluten free options as well. Lots of desserts and plenty to choose from. Roy's has the absolute best donuts in town. Their coffee selection is massive (at the beginning of the day) but does deplete to just decaf at around 11am. A donut and coffee cost you less than just coffee at biggby, and the quality of way higher. Also the view is incredible looking over the Portage. Ok. I only go here on Fat Tuesday. Dope paczki. Heavy duty package of joy wrapped in flaky pastry and stuffed full of a day's required calories. Sat outside for a great river view. Chicken broccoli pasty is the best! Chicken and broccoli... life changing. The only place I go to get a quick pasty! Best pasties I've ever had! And that includes my own. It's one of the places we make sure to stop at every time we're in Houghton. Worth the stop. Delicious, fresh, and filling. Roy and his crew have catered the bakery for several large weddings at our venue and the donuts, petit fours,cakes, cupcakes and cookies were perfect. They went above and beyond to make sure our guests were satisfied. BEST PASTIES IN THE U.P.!!!! Hands down the pasties here were the best we tried in all of the U.P. And the deliciousness doesn't stop at those delicious little meat and potatoe filled pies (pasties). They also have delicious sandwiches and soups that I've never been disappointed in. Don't even get me started on their desserts either.